The Big Bend of the Rio Grande--what a land of contrast! Desolate badlands, forested mountains, a long island of green supported by the river's flow, sun-baked hillsides and canyons so deep the direct sunlight barely penetrates. These are desert lands burgeoning with life. Known in Mexico as La Gran Curva or La Gran Comba del Rio Bravo, Big Bend country is like nowhere else. Lightly visited and remote, Big Bend National Park, Texas is one of the least known in the park system. Encompassing a huge sweep of the northern Chihuahuan Desert, at first glance the land seems lonely and inhospitable. Soils are barren and shade is scarce. It's surprising to learn that American Indians hunted here 10,000 years ago and that families of our grandparents' generation came to love the Big Bend as home. 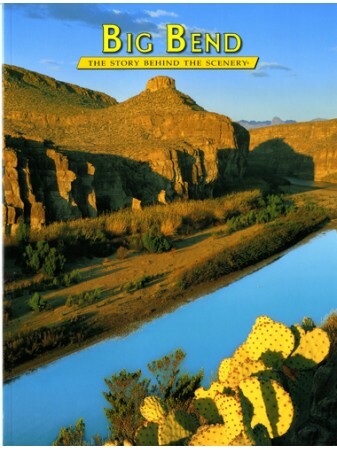 Big Bend, the Story Behind the Scenery, reveals the secrets of this formidable land, its geology, flora, fauna and extensive human history. Add this amazing book to you shopping cart now.